Evelyn M. Wood Lovejoy, History of Royalton, Vermont, , at https://books.google.com/books?id=XDQTAAAAYAAJ . Burlington, Vermont: Free Press Printing Company, (1911) , p. 766. Harrison Colby, A genealogy of the descendants of Abraham Colby and Elizabeth Blaisdell, his wife, who settled in Bow in 1768, , at https://archive.org/details/genealogyofdesce00colb . Concord, N.H.: Printed by the Republican Press Association, (1895) Microfilm #896944 of the Family History Library, Salt Lake City, Utah, p. 118-120. 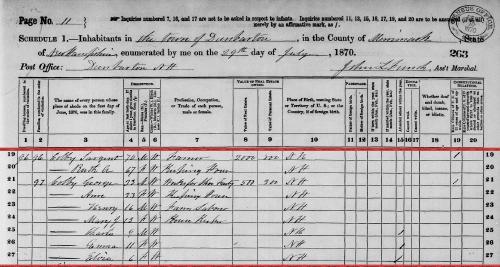 "United States Census, 1900," database with images, FamilySearch (https://familysearch.org/pal:/MM9.3.1/TH-267-13033-188363-74?cc=1325221 : 5 August 2014), New Hampshire > Merrimack > ED 151 Concord city Ward 4 > image 23 of 36; citing NARA microfilm publication T623 (Washington, D.C.: National Archives and Records Administration, n.d.). "New Hampshire, Death Records, 1654-1947," index and images, FamilySearch (https://familysearch.org/pal:/MM9.1.1/FSNB-1PV : accessed 14 Dec 2012), Sarah E. Colby, 23 Jan 1903. Biographical Review, Vol XXIII. Containing Life Sketches of Leading Citizens of Hillsboro and Cheshire Counties, New Hampshire., , at https://archive.org/details/leadingcitizensh00bost . Boston: Biographical Review Publishing Compan, (1897) , p. 81. 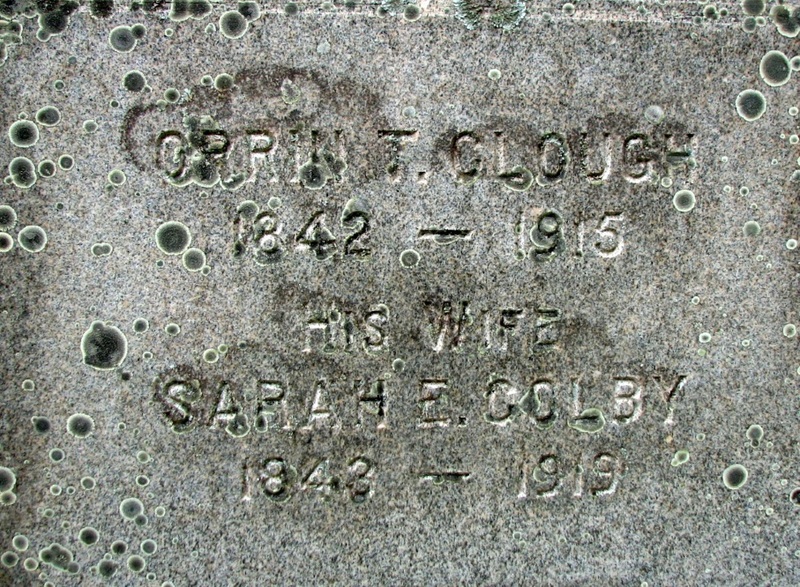 "New Hampshire Marriage Records, 1637-1947," database with images, FamilySearch (https://familysearch.org/ark:/61903/1:1:FLXQ-14W : accessed 4 April 2016), Orrin Clough and Sarah E. Colby, 22 May 1867; citing Goffstown, , New Hampshire, Bureau of Vital Records and Health Statistics, Concord; FHL microfilm 1,000,978. 1880 United States. Census Office. 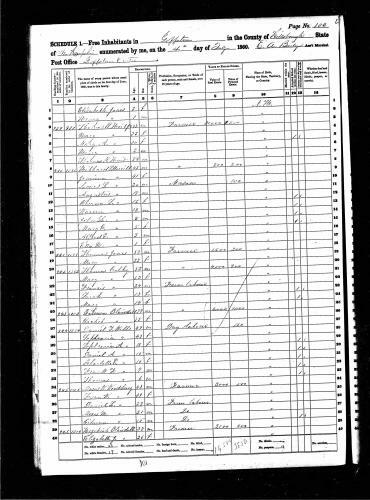 10th census, 1880 federal population census, Washington, District of Columbia: National Archives and Records Service, ([19--]) , FHL Film 1254766; National Archives Film T9-0766; Page 221D. 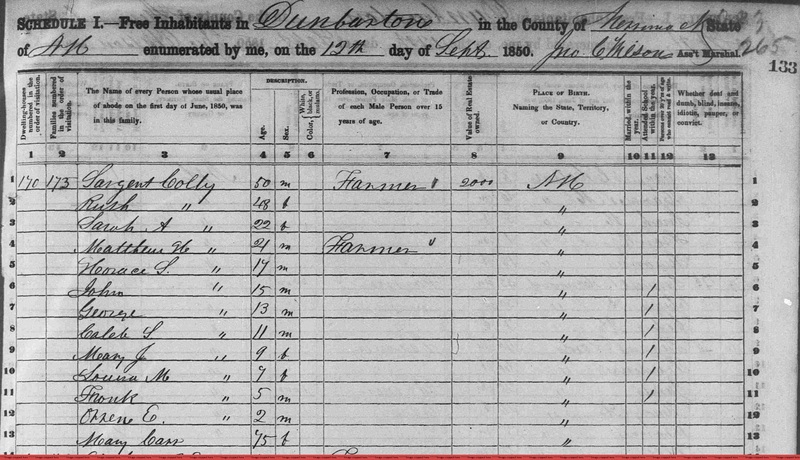 "United States Census, 1910," database with images, FamilySearch (https://familysearch.org/ark:/61903/1:1:MLZ4-HZ7 : 29 October 2015), Orrin F Clough, Manchester Ward 6, Hillsborough, New Hampshire, United States; citing enumeration district (ED) ED 142, sheet 12B, NARA microfilm publication T624 (Washington, D.C.: National Archives and Records Administration, n.d.); FHL microfilm 1,374,876. Record added: Aug 25, 2012. 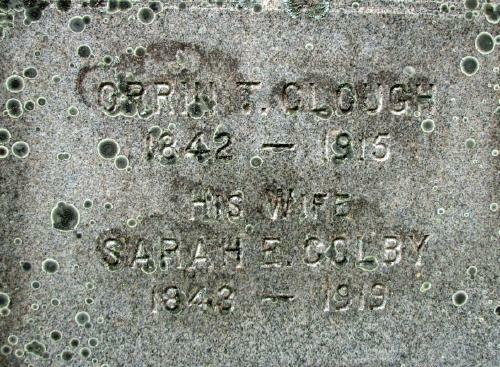 "New Hampshire Marriage Records, 1637-1947," database with images, FamilySearch (https://familysearch.org/ark:/61903/1:1:FLFY-D4G : 12 December 2014), William T. Sanford and Sarah Jane Colbey, 07 Nov 1842; citing Goffstown, Hillsborough, New Hampshire, Bureau of Vital Records and Health Statistics, Concord; FHL microfilm 1,001,306. 1880 United States. Bureau of the Census. 10th census, Ohio, 1880 federal census : soundex and population schedules, Washington: The National Archives, ([19--?]) , FHL Film 1255059; National Archives Film T9-1059; Page 265D. Harrison Colby, A genealogy of the descendants of Abraham Colby and Elizabeth Blaisdell, his wife, who settled in Bow in 1768, , at https://archive.org/details/genealogyofdesce00colb . Concord, N.H.: Printed by the Republican Press Association, (1895) Microfilm #896944 of the Family History Library, Salt Lake City, Utah, p. 109. David W. Hoyt, The old families of Salisbury and Amesbury Massachusetts : with some related families of Newbury, Haverhill, Ipswich, and Hampton, and of York County, Maine / David W. Hoyt., Vol. 2, , at https://archive.org/stream/oldfamiliesofsal02hoyt . Providence, R. I.: Snow & Farnham, (1897) , p. 675. 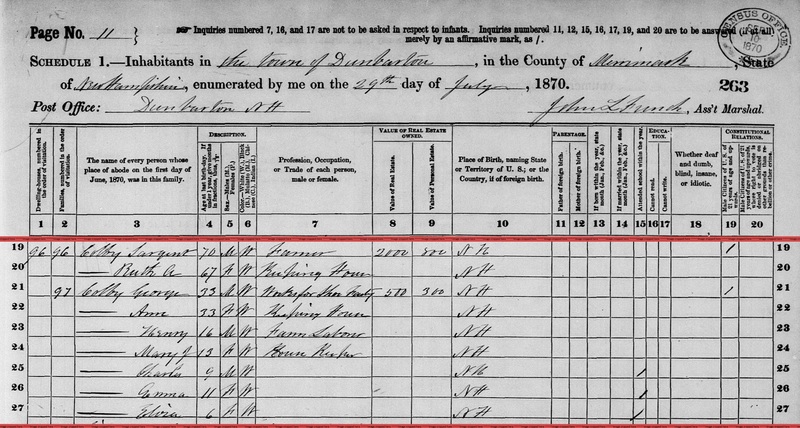 "New Hampshire Birth Records, Early to 1900," database with images, FamilySearch (https://familysearch.org/ark:/61903/1:1:FL2T-SBD : 12 December 2014), Sargent Colby, 17 Jun 1802; citing Dunbarton, Merrimack, New Hampshire, United States, Bureau of Vital Records and Health Statistics, Concord; FHL microfilm 1,000,378. Harrison Colby, A genealogy of the descendants of Abraham Colby and Elizabeth Blaisdell, his wife, who settled in Bow in 1768, , at https://archive.org/details/genealogyofdesce00colb . Concord, N.H.: Printed by the Republican Press Association, (1895) Microfilm #896944 of the Family History Library, Salt Lake City, Utah, p. 118. "New Hampshire, Marriage Records, 1637-1947," index and images, FamilySearch (https://familysearch.org/pal:/MM9.1.1/FLXW-RF1 : accessed 15 Dec 2012), H.J. Tirrell and Mary Jane Colby and null, 1862. Priscilla Hammond, Gravestone inscriptions from all cemeteries within the township of Dunbarton, New Hampshire, 1758-1933, Concord, N.H.: (1933) Microfilm #908590 of the Family History Library, Salt Lake City, Utah. Harrison Colby, A genealogy of the descendants of Abraham Colby and Elizabeth Blaisdell, his wife, who settled in Bow in 1768, , at https://archive.org/details/genealogyofdesce00colb . Concord, N.H.: Printed by the Republican Press Association, (1895) Microfilm #896944 of the Family History Library, Salt Lake City, Utah. "Massachusetts, Deaths, 1841-1915," index and images, FamilySearch (https://familysearch.org/pal:/MM9.1.1/N46B-S2Q : accessed 15 Dec 2012), Henry J Tirrell in entry for Mary J Tirrell, 1915. John J.Dearborn, The History of Salisbury, New Hampshire, , at https://books.google.com/books?id=_9ThwN-QpVYC . Manchester, N. H.: William E. Moore, (1890) , pp. 527-8. Social Security Death Index, at http://www.ancestry.com/ssdi/advanced.htm, Social Security #: 002-22-2033. Massachusetts Vital Records, 1841-1910, , Vol: 46 ; Page: 99. "New Hampshire Birth Records, Early to 1900," database with images, FamilySearch (https://familysearch.org/ark:/61903/1:1:FL2T-3W5 : accessed 11 November 2015), Simon Perkins Colby, 21 Aug 1797; citing Weare, Hillsborough, New Hampshire, United States, Bureau of Vital Records and Health Statistics, Concord; FHL microfilm 1,000,378. "New Hampshire Marriage Records, 1637-1947," database with images, FamilySearch (https://familysearch.org/ark:/61903/1:1:FLXF-1KF : 12 December 2014), Hon. Simon P. Colby and Miss Louisa Bartlett, 06 Oct 1840; citing , Bureau of Vital Records and Health Statistics, Concord; FHL microfilm 1,000,976. "New Hampshire Birth Records, Early to 1900," database with images, FamilySearch (https://familysearch.org/ark:/61903/1:1:FL2R-5M3 : 12 December 2014), Franklin Pierce Colby, 19 Apr 1841; citing Weare, Hillsborough, New Hampshire, United States, Bureau of Vital Records and Health Statistics, Concord; FHL microfilm 1,000,378. 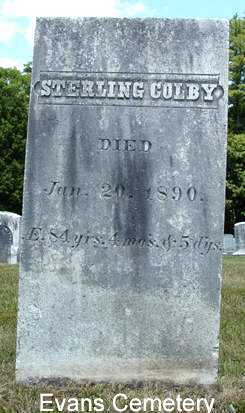 He was the son of Philip Colby and Hannah Bailey. COLBY FAMILY & OTHERS at http://freepages.genealogy.rootsweb.com/~colby/colbyfam, /d211.html. Skillings, Susan B., widow, boards 2 Lane. Skillings, David G. clerk. boards 24 Fremont. Skillings, Susan B., widow of David G. senior. house 24 Fremont. "New Hampshire, Birth Records, Early to 1900," index and images, FamilySearch (https://familysearch.org/pal:/MM9.1.1/FL2T-SVN : accessed 05 Dec 2012), Susan Colby, 18 Sep 1825. "Massachusetts, Births, 1841-1915," index and images, FamilySearch (https://familysearch.org/pal:/MM9.1.1/FXCZ-5BJ : accessed 23 Nov 2012), David Skillings, 1853. 1880 United States. Census Office. 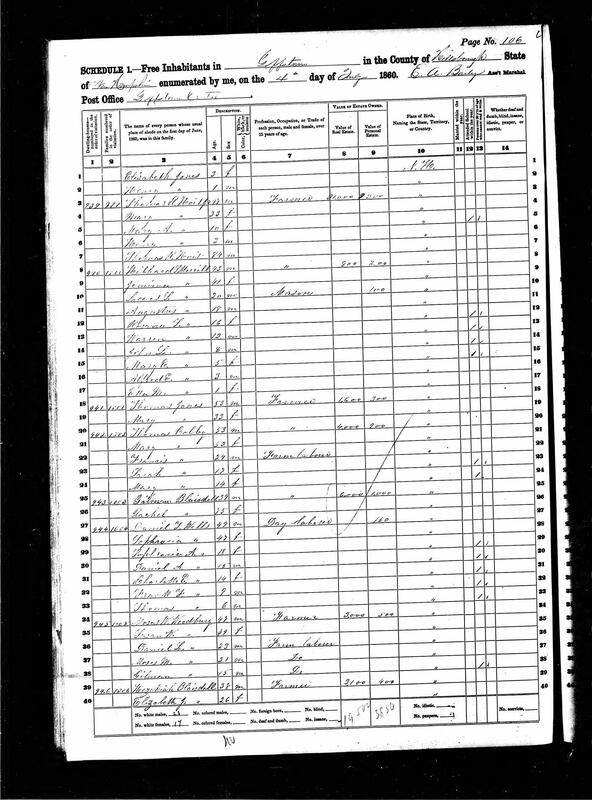 10th census, 1880 federal population census, Washington, District of Columbia: National Archives and Records Service, ([19--]) , Census Place: Lowell, Middlesex, Massachusetts; Roll: 544; Family History Film: 1254544; Page: 224A; Enumeration District: 455; Image: 0739. Town and City Clerks of Massachusetts, Massachusetts Vital and Town Records, Provo, UT: Holbrook Research Institute (Jay and Delene Holbrook), , Lowell > Births, Marriages and Death > 7193. 1900 United States. Census Office. 12th census, 1900 population census schedules, Washington, District of Columbia: Bureau of the Census Micro-Film Laboratory, ([197-]) , Census Place: Lowell Ward 6, Middlesex, Massachusetts; Roll: 660; Page: 8A; Enumeration District: 0803; FHL microfilm: 1240660. Massachusetts Vital Records, 1841-1910, , Vol: 56 ; Page: 107. Amesbury (Mass. )., Vital records of Amesbury, Massachusetts, to the end of the year 1849., Page: 600 p. ; 24 cm. (n.p. : Topsfield Historical Society, Topsfield, Mass., 1913, unknown publish date), p. 57.